I finally finished seaming Evie just in time for Easter but have only just got around to sharing. Knitted in Rowan 4ply cotton which comes in so many lovely shades but is seems to be so slow for me to knit with, something to do with the lack of give in the yarn? I'm not sure, but whatever it is it makes for slow knitting for a child's garment. I do love it though and a cotton sweater is so useful for cooler spring and summer days. The sizing is huge again, I made age 4-5, Tilly will be 5 in November, in particular it seems very wide, this seems to be case with so many children's patterns but I never quite have the nerve to adjust them. Oh well, at least she will get plenty of wear out of it. The daisy embroidery continues, I made a sample to begin with and I love how that came out but can't seem to get the same fluidity in the second attempt, typical huh? It is the same with taking photographs for the blog, I take maybe 15 shots but the first one is still the best. And now I must go and do some watering in the garden, yes that's right, water, in April!! Crazy I know but precious new plants are fading in this amazing weather. Where are those April showers? Tilly is adorable. I love the way the sweater is oversized and the sleeves rolled. It is "a look." And the pin is very cute too! Our flowers are just beginning to pop up, but they look rather anemic. Tilly is a beautiful little girl, and the sweater looks perfect to her! :) So cute! What a cute sweater! Doesn't look too big -- seems to be the style! Is the pinny for Tilly? You are right - Tilly lloks lovely in lilac. Doesn't look too big - just sylishly right to me. Oh, wht a beautiful little girl! I love the oversized look on little kids. And, like you said, she'll get lots of wear from it. Loving the sweater, and I think it looks gorgeous on your little girl too. The color is quite pretty, and thinner yarns always take more time to knit up. Kid's sizing unnerves me as well. I am currently about to knit a sweater for the third time, as first according to pattern it turned out way too big, then I worked it too small. Hopefully, it will be okay this time or I'll give up on that pattern. I think the 4 ply cotton always knits up slowly unless there is a pattern to distract you from the boredom - it was worth it though - Tilly looks delicious in it. The flower finishes it off beautifully. Tilly looks adorable and the sweater is fabulous! 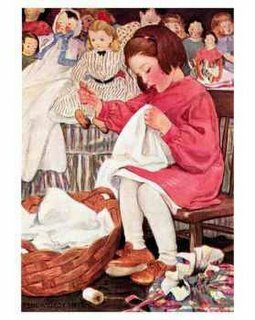 I wish I knit when my girls were young--now they're all grown up and knitting a sweater for them would be like knitting a sweater for me!